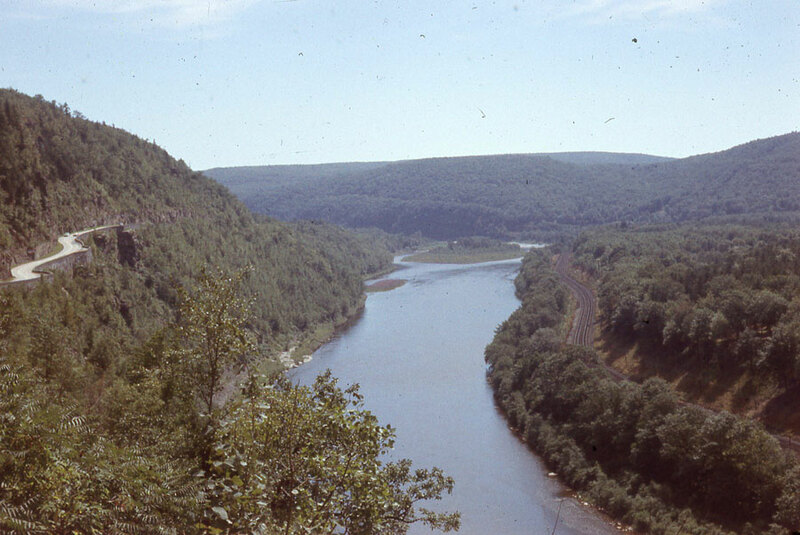 The winding Hawk’s Nest Road overlooking the Delaware River and the Erie railroad offered the sort of scenic drive my Dad loved best. For a mere century automobile road trips have been a signature element of the American experience. Of course, humans have been on the road for a lot longer than that. Since the days of ancient Rome restless souls have followed the urge to go see what’s over the next hill, around the next bend, across the wide river. But in this country, when we say road trip, we mean a couple of people or more, piled into a car (any car will do), driving for hours, maybe days, even weeks, having adventures, some planned, some not. Not everyone enjoys such things, especially considering the way the modern highway system has been designed to increase speed limits at the expense of scenery. There was a time when the journey could be at least as enjoyable as the destination. I was five-years-old on my first road trip. My dad, newly graduated from law school, had a job offer in San Francisco. So he packed up everything we owned in our new 1954 Ford station wagon and headed west with three kids and our mom, who was pregnant with number four. We stayed at National Parks all across the country—Yellowstone, Yosemite, the Dakotas. We traveled the Oregon Coast and camped in the Redwood Forest. I’ll admit, I don’t remember a lot about it. At that age you don’t have enough perspective to understand what you’re seeing. Fortunately, my dad took a lot of slides, and in later years he took pains to remind us of what a big and beautiful country we lived in. 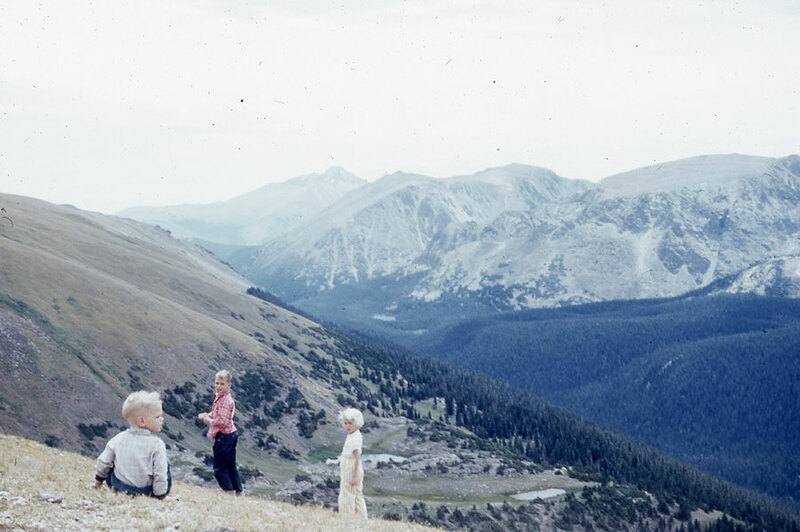 My brothers and I admired Long’s Peak in the Rocky Mountains in 1954. All his life my dad loved to get in the car and drive places. When, in his late 80’s a few years before he died, his vision and reflexes deteriorated to the point that he had to give up his driver’s license, I think it took a lot of the fire out of him. He longed to go on one more road trip. But at the same time, as he grew older he lamented how the forces of increasing population and construction had altered the landscape. In Fairfax County, Virginia, where we ended up after the job my dad had driven across country to take didn’t work out (we turned around and drove back east), there were still cows and horse farms around Tysons Corner. There was no beltway. The day it opened people drove on it just to experience the wonder of it. It was supposed to free us all from traffic congestion. Well, journeys sometimes take you places you never expected to go. And sometimes they lead you right back where you started. But nothing ever stays the same, so in a way, the journey never ends. Some people waste their whole lives looking backward, wishing they could return to the way things were. Others miss out on the here and now because they’re in such a hurry to get to what’s next. I’m grateful that my dad taught me to get out of the car and look around, to take the measure of each place and time and be thankful for what is, even while we work toward what could be. It’s not all good, but it’s not all bad. And sometimes, if you get off the interstate and wind into the heart of the country, you can see. It’s a miraculous place. Take a deep breath. And keep going.